I began my art career (more years ago than I care to remember) as an abstract painter. I worked large. In those days a panel the size of the one above would have been considered a small work by me. Working on paintings as large as 5x8 feet was physical and liberating. I enjoyed experimenting with the application of paint by using different tools besides brushes. Lately I have felt the itch to revisit that approach to painting but this time I wanted to apply it to a representational image and this time not so large. Off I went to the hardware store and selected tools that I thought would help me create an interesting surface. I selected a 3" wide, flexible edging blade (love it! ), another edging tool which is a one inch wide wooden roller, and a 6" wide plastic paint smoother. I also unnearthed an old rubber brayer I used years ago. 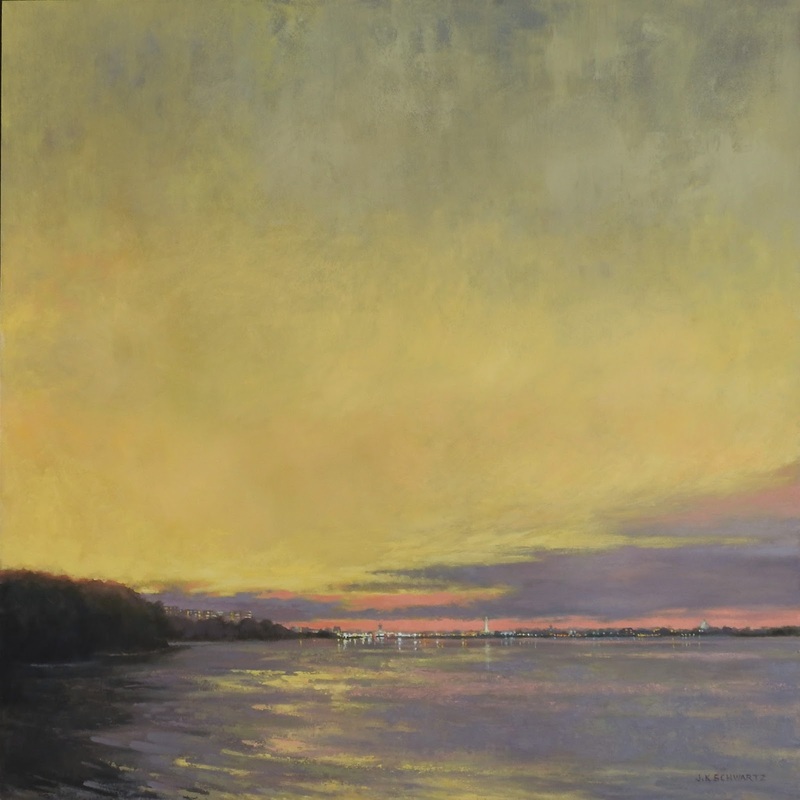 Next I did a color study in my sketchbook of a view I am very familiar with, it is the view of DC seen from the point off Daingerfield Island on the Virginia side of the Potomac River. I paint from that location often and working from memory I didn't get hung up on detail. I used a limited palette of Paynes Gray, Alizarin Crimson, Vermilion, Yellow ochre, Naples Yellow and Titanium White. I propped the study up next to my panel and got to work. Ampersand gesso board can be slippery to work on so I like to heavily gesso the panel again myself. I used both my wide gesso brush and a paint roller leaving behind the texture created by both. Then I pulled out my large brushes (2" and 3"), all my palette knives as well as the above mentioned tools and started layering on paint working dark to light. The water was painted almost entirely with the new 3" edging blade and palette knives. The sky was worked from the top down first with the same 3" blade, then the brayer and the 3" brush. 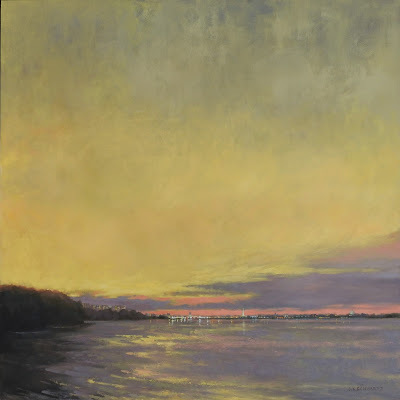 As the sky descends towards the horizon line the paint is applied heavier with palette knives and bristle brushes. Like many of you on the East Coast of the US I have been enjoying the warm, early spring weather and that has been reflected in my choice of palette for recent paintings. 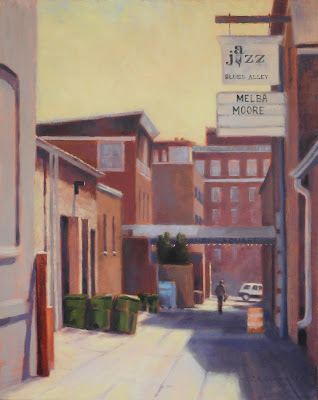 This painting outside Blues Alley, a popular jazz club in Georgetown in an alley of the same name, was originally planned as a moody nocturne. However, I was inspired by the weather and chose instead to paint early morning light, sort of a "morning after" narration of the scene. In fact the original, on site sketch was created in morning light last May. It was a quick ballpoint sketch in the 4x6" sketchbook I like to carry with me. I didn't think of it again until last fall when I did a color study for it using the morning light from my sketch and then decided to shelve the painting until I could view the scene at night as I thought a nocturne would create a more fitting mood for the scene. Then flipping through my sketchbook looking for inspiration late in February I decided to go with what I had and add some atmosphere to the strong contrast of light and dark of the morning light. I am pleased with the outcome but I still want to do a moody Blues Alley at night! Below are the little 4x6 inch sketch from last May and the color study from the fall. I like working from these better than from a photo because they represent what was important to me in the scene, sort of a short hand of everything that was there. Incidentally, I originally added the overhead wires in the painting but felt that they did not add to it and were just literal elements so I painted them out to strengthen the composition.